Below are sculptures of animals in a variety of materials. Feel free to add anything you like in terms of found materials. I like the way the zebra heads stand alone and are suspended. I also like the horse and the texture of the wood. 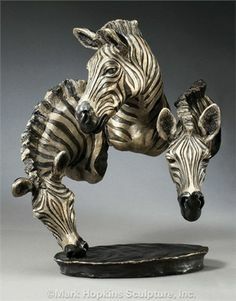 these are really cool, i like the zebra heads because they look like theyre floating and the horse because it is life sized. These are amazing and the horse one is my favorite because it's impressive that it's life size. These are all really cool and must have taken a long time to do. my favorite is the fox. the fox is awesome. My favorite is the 3rd, i like how they formed the bird. those look really cool. I wish i was able to do this.